Owwwwwooooooooo! Verrry Scary Keeds! Heh, heh, heh! 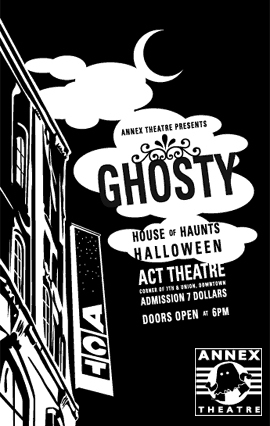 So, if you're in the neighborhood of ACT Theatre this Sunday evening, you should really check out Ghosty! Annex Theatre's spooky Hallowe'en extravaganza (I'll be the ghost in the aviator's helmet). Plus, it's a fundraiser for Union Playhouse (Nee Union Garage, current home of Theatre Babylon and future home of Annex), so you just KNOW you want to help save one of Seattle's most versatile, valuable and vulnerable performance spaces. Otherwise, the ghosts will haunt you long after the toll of Midnight on Sunday.